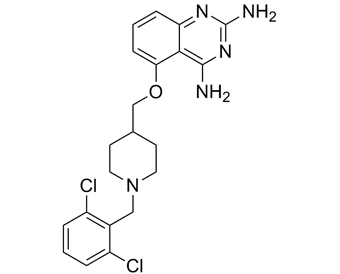 RG3039, also known as PF-06687859, is a potent DcpS inhibitor. DcpS is a therapeutic target for spinal muscular atrophy. Spinal muscular atrophy (SMA) is caused by deletion or mutation of both copies of the SMN1 gene which produces an essential protein known as SMN. RG3039 improves motor function in SMA mice. RG3039 also showed activity to improve survival, function and motor unit pathologies in two SMA mouse models.
. Gopalsamy A, et al. Design of Potent mRNA Decapping Scavenger Enzyme (DcpS) Inhibitors with Improved Physicochemical Properties To Investigate the Mechanism of Therapeutic Benefit in Spinal Muscular Atrophy (SMA). J Med Chem. 2017 Apr 13;60(7):3094-3108.
. Gogliotti RG, et al. The DcpS inhibitor RG3039 improves survival, function and motor unit pathologies in two SMA mouse models. Hum Mol Genet. 2013 Oct 15;22(20):4084-101.